If I hadn’t paid close attention and hadn’t carefully lined up the mesh to be flush with the edge of the entrance hole, the bees would have had less openings that they could fit through. With a smaller entrance hole, say half an inch, every opening in the mesh could be easily blocked if the mesh wasn’t put in place properly. So that’s it. The bees can get through 6mm / quarter inch mesh. But it has to be done right. See my older post, Quarter-Inch Mesh Doesn’t Always Knock Off Pollen (which contains a video of bees walking through the mesh), for more of my observations on all this. I use 6mm / quarter-inch mesh to keep shrews out of my hives because in the winter of 2015, I lost six out of my eight colonies to shrew predation — and I will never ever allow anything like that to happen again. It took me five years to build up my beeyard to that point. It took almost two years to build my colonies back up again. It’s been more work than pleasure, and if I don’t soon begin to enjoy beekeeping as much as I used to, I’m out. So that’s where I’m coming from with my insistence in using 6mm / quarter-inch mesh to keep shrews out of my hives. I know half-inch mesh doesn’t keep shrews out. I’ve caught a few of the shrews and they are tiny little buggers. I had half-inch mesh on my hives during the winter of 2015. It didn’t work. I know some beekeepers who use 3/8-inch mesh to keep shrews out. I also know some beekeepers who use quarter-inch mesh. And because I have no desire ever to take any chances with shrews getting in my hives again, I’ve opted for quarter-inch mesh. Am I a little paranoid? Am I playing it too safe? You’re damn right I am. There is no way I will chance losing 75% of my colonies again. If it happens again, that’s the day I quit beekeeping. I’m still working out the kinks in my system, but my general approach — in my local climate with Langstroth hives — is to attach the mesh by the first week of October on the bottom entrance, using pushpins, not staples, keeping the top entrance open for a few more weeks when the bees are usually done collecting most of their pollen for the year. Drones have difficulty getting through the mesh, and sometimes the mesh will knock off pollen from the bees’ legs. Overall, the mesh may slow them down, but they manage to get through it no worse for the wear. If I put mesh on the top and bottom entrance at the same time, yes, some pollen would fall off the bees, but it wouldn’t be the end of the world. And shrews would never get in. Later in the winter when some dead bees have collected near the bottom board, the pushpins allow me to easily and quietly remove the mesh so I can clean out the dead bees, without disturbing the colony, which I do maybe two or three times over the winter. It’s easier for the bees to pull dead bees through half-inch mesh, but the dead bees can still build up and clog the bottom entrance with half-inch mesh too. For me, there’s little disadvantage to using quarter-inch mesh. So that’s what I do and why I do it, and so far, it works. This entry was posted in Building Stuff, Dead Bees, Mesh, Month of November, Month of October, Pollen, Shrews and tagged Practical Tips. Bookmark the permalink. This is probably one of those issues (like ventilation, winter wrapping, warm versus cold configuration on the frames) that leads to interminable debate. Had you said that you had bad predation by shrews using 3/8″ diameter mouse guards I would be better persuaded by the argument for 1/4″ mesh. I used 3/8 last winter with no shrew problems and no build-up of dead bees by the lower entrance. However, all things are not equal, because I use hive stands (12″ elevation) not pallets, and we never had enough snow buildup to allow shrews to walk across the snow to the hive landing board. So, I may have other factors that mitigated against shrew predation. Yes, I witness both workers and drones egressing and ingressing through the 1/4″ mesh, but hauling the dead drones out is certainly difficult for them. It appears they can remove dead workers through that mesh. Something else to consider is that I used half-inch mesh from 2010-2015 with no problems. It kept the mice out. (No one ever told me about shrews, only briefly in passing.) Shrews didn’t show up until I moved my hives to a rural location. Shrews may not be a problem in certain locations. I didn’t see a single sign of a shrew when my hives were in the city. I switched to quarter-inch mesh on the advice of Michael Bush. He also argues that using top entrances only will prevent critters from getting in, but I found shrew tracks and dropping in the snow above my hives — so under certain circumstances, the shrews can get up there. Maybe not where he lives, but at least where I used to keep my bees in Logy Bay. Some beekeepers use 3/8-inch mesh, and others others use 1/4-inch. I’d rather not see any more 18 degree days like we had to today. Most of November so far seems on the warm side. I normally put sugar on my hives right about now because it’s usually so cold that the bees are clustering below the top bars. But not when it’s 18 degrees Celsius — and they’re consuming more honey. I want cold weather, not warm weather. If this keeps up, all my bees are going to start starving long before spring arrives. I’m sticking with the 1/4″ mesh as well. I’m not taking any chances withs shrews. 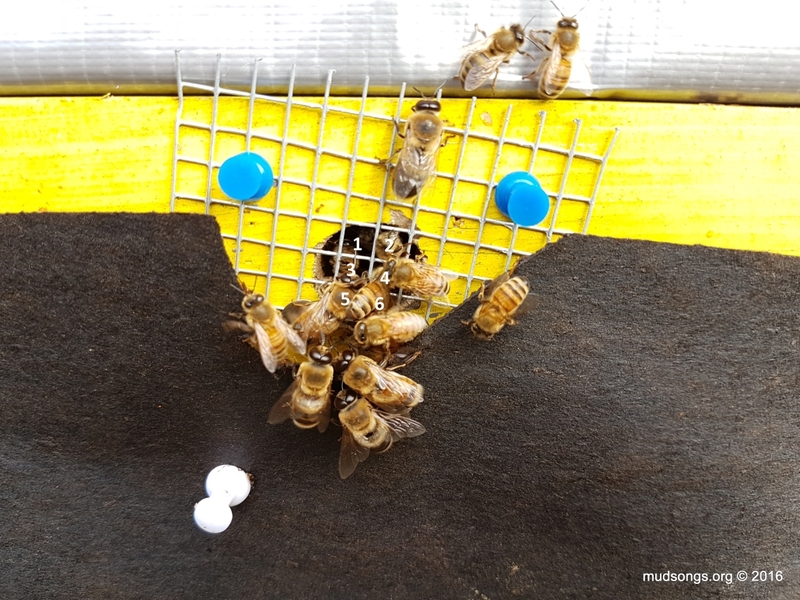 (as a new beekeeper I have enough to worry about and rather stick with whats proven to work) I agree with Paul and Brenda- hooray for push pins and moisture quilts – thank you Phillip! I’ve also been wondering about the ill effects of such a warm autumn. I added a few sugar cakes when I wrapped the hives during a cold spell early in November. The bees were clustered down below then so I thought it was a good opportunity to pop them in there. There are some sugar crystals on the bottom & landing board but the bees aren’t really working to remove it. They seem to be eating it, and I’m hoping its keeping them busy and out of trouble (robbing) during this warm spell. I’ve never wished for a cold winter before keeping bees! I’m in the process of making sugar cakes for my hives, but I may not put them until December now. It looks like the next week or so are going to be warm. All the bees flying around yesterday means more bees eating honey. I’d rather see cold weather from now until spring… with the occasional warm day for cleansing flights. How’s this for a compromise solution? – Use both 3/8 and 1/4 when appropriate. This is the reply I just received from Fletcher Colpitts, the provincial apiarist for New Brunswick. “Yes shrews can get through 3/8″ mesh. I use 1/4″ mesh. We put the 1/4″ mesh winter blocks on late enough in the year just as the bees have gone into the winter cluster and not doing any hive work anymore. Usually , here in NB, it can be as late as mid-December. At this time they are not doing hive work or flying so the problem of plugging up the mesh is avoided. Before this we have hive reducers on with 3/8″ holes so the bees can clean the hive of dead bees. I know that shrews can get through 3/8 ” holes so I have to go to 1/4″ mesh. If I leave the reducers on with the 3/8″ holes into winter shrews will go through them. I think all of us have been shocked by Phillips great loss to shrews. They destroyed six of eight colonies if I remember correctly and just think they were introduced to the island. Mice, shrews and rats (my favourite) mostly come out at night and they can also chew through wood with ease. Not only are we using 1/4″ mesh I’m also planning on setting traps should I see any tracks in the snow. I will place at least six under each hive for about a week. My hives are up on pallets so I can block around each pallet so only small unwanted rodents can get access. I can still bury the hives in snow should we get any but keep the sides of the pallets free for setting traps. You can do the same thing under your hives. A couple of small wooden boxes under your hives with holes that only a mouse or shew can get in. Make sure you place more traps than you really need and you will catch them before they even get close to getting into your hives. You can also puchase live traps that you can place in the wooden boxes and they will keep catching mice and shrews as long as you leave them out. The other concern that Kim mentioned and it would really be hard to take would be installing 1/4″ mesh and locking a mouse or shrew into the hive. The hit I took from the damn shrews was easily the worst thing that’s ever happened to my bees. I read about a beekeeper in PEI and another in NB who both lost more than half of the colonies in their commercial operations the same winter. It seems like conditions were perfect for shrews that year. What baffles me is that no one ever told me that shrews were do so destructive. No local beekeepers ever mentioned shrews. Most beekeeping books I read didn’t say anything. Hardly any beekeepers online ever said anything about shrews. Unless they all consider shrews and mice to be the same thing — which they are not. I thought I was prepared for everything. But shrews weren’t even on my radar. I probably read a few online articles by Fletcher when I realized I had a shrew problem. I may have even posted links to them back when it happened. I probably did. I recognize his name. I think he was one of the few people I found online who offered a solution and said 3/8-inch mesh was too big to keep them out. I can’t remember now because at the time I was trying to act fast and didn’t have time to fart around. All I remember learning is that shrews weren’t getting through quarter-inch mesh and that was good enough for me. It still is. I’m not buying 3/8-inch mesh on top of everything else. I’m really getting tired of all the money I have to keep spending on my bees. I’ll put the 1/4-inch mesh on with pushpins by the first week of October; keep the top entrance open while late-season pollen is still coming in; easily remove the mesh on the bottom entrance once in a while to clean out dead bees; and remove it altogether once the bees are active again in the spring. That had to be an incredibly hard lesson to learn. I believe many people would call it quits after such a devistating loss. The fact that you shared your experience with everyone to help prevent them from going through the same horrible experience is a great act of kindness. Thank you so much!